Kitty might be holding out for that tasty treat. It’s a fact universally acknowledged amongst felines that you should always hold out for the very best life has to offer, even if Mom or Dad doesn’t agree. When applied to food, this philosophy can result into a battle of wills between cats and the people they own. Feeding Sheba on demand may result in her asking for food from habit rather than genuine hunger. Your pet might also be holding out for that gourmet delicacy you normally reserve for a weekend treat, particularly if she learns that refusing to eat one dish results in a more appetizing one materializing soon after. Scientists call this “learned behavior,” but it’s just common sense as far as Sheba’s concerned. Because food symbolizes nurturing, Tigger may be exhibiting an emotional response to food when he asks for it and doesn’t eat it. 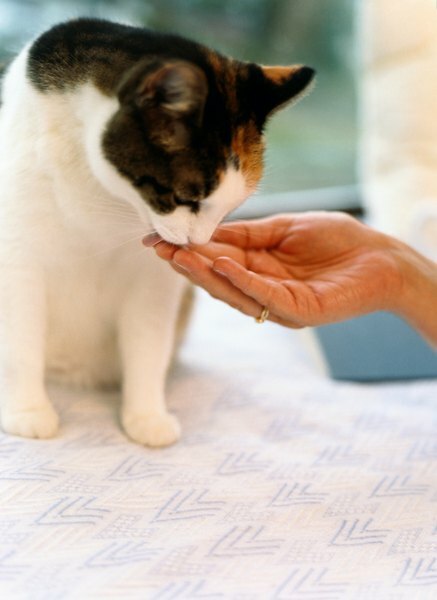 According to researchers at the University of Vienna, kitties perceive food as a token of affection. In loving homes, the relationship between cats and their people mirrors the relationship between mothers and pre-verbal infants. 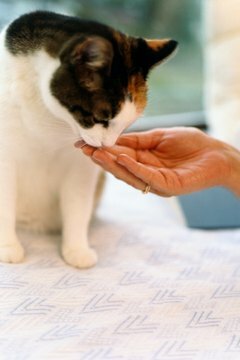 Your pet might simply enjoy the attention and comforting ritual associated with mealtimes, particularly if you pet him or fuss over him before feeding him. Distracting him with a game of catch or letting him sit on your lap will help you to distinguish between a desire for attention and a desire for food. It’s important to schedule a veterinary check-up if your pet is eating less than normal and is losing weight. A reduced appetite accompanied by weight loss is a warning sign that there may be an underlying medical problem. An elderly kitty in particular is more susceptible to conditions, such as gum disease or reduced kidney function, that might make him feel too unwell to eat, even if he asks for food. Sticking to a regular feeding routine and ignoring vocal requests for food outside set mealtimes will help to eliminate erratic eating habits. Regular mealtimes also give your pet’s digestive system much needed down time and encourages a healthy appetite. A high-quality diet, based on Sheba’s nutritional needs for her age, weight and overall health, helps to eliminate those cravings that make her refuse food because she’s hoping for a tastier alternative. As feline nutritionist Pam Johnson notes, patience and perseverance is key when weaning your pet off fussy eating habits because your kitty will “pull out all the stops to make you feel guilty,” which includes crying, pleading and convincing you that she feels unloved!